I know I should eat breakfast, but sometimes the wfpb breakfast recipes seem like way too much work right after I’ve woken up. Usually I will eat a bowl of rolled oats with banana or apple and cinnamon topping. It’s kind of my go-to thing. I get bored of it occasionally and make fruit smoothies, but sometimes I want something more “substantial” to eat. This hot cinnamon-apple cereal from The PlantPure Nation Cookbook helps fill me up and makes enough for leftovers the next couple of mornings. 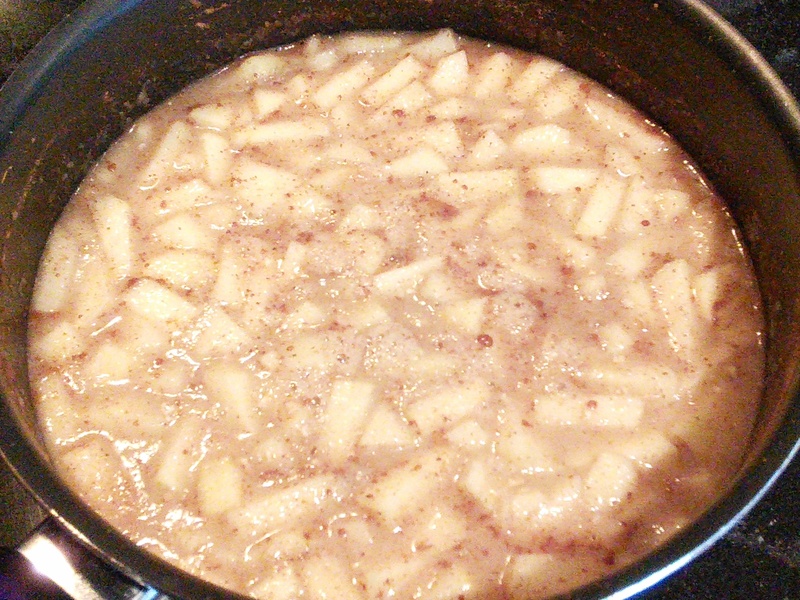 The brown sugar/Sucanat gives it a great flavor along with the applesauce and spices. Optional Toppings: Extra plant-based milk for serving, your favorite berries, or nuts! Combine all the ingredients in a saucepan over medium heat. Bring to a low simmer and cook for 20-30 minutes, until the oats are tender and the liquid is close to being completely absorbed. In the picture below (on the right), I had it simmering for about 25 minutes. Remove from the heat and serve with whatever toppings you like! I used cherries and blueberries on my bowl.